Tiki Pop is a cultural movement that evolved in the U.S. and was based on western interpretations of the Maori and Polynesian cultures. The roots of the movement were first planted in the late 18th century when navigators in their attempts to explore the globe, discovered exotic tropical islands and encountered the Polynesian, and in particular, Maori cultures. The explorers returned to Europe and told stories about the people and lifestyles in these strange new lands. The fondness for all things Polynesian eventually grew to a Tiki craze by the mid-20th century, and reached a crescendo in the 1950s and early 1960s. There is a Tiki revival currently underway, but before we get to that, a little history on how it all started. Inspired by the tales of these explorers, authors wrote adventure stories set in the South Sea islands and on the waters of the South Pacific. Readers of these stories developed romanticized notions about the tropical locales and the concept of an idealized native lifestyle emerged in westerners’ minds. Proper, buttoned-up society found a life without responsibility and with a fair share of hedonism very appealing. Symbols of Polynesian culture like sacred carvings known as the ki’i (eventually becoming known as tiki statues), were claimed as souvenirs by explorers who brought them back to Europe and the U.S. to be put in private collections. 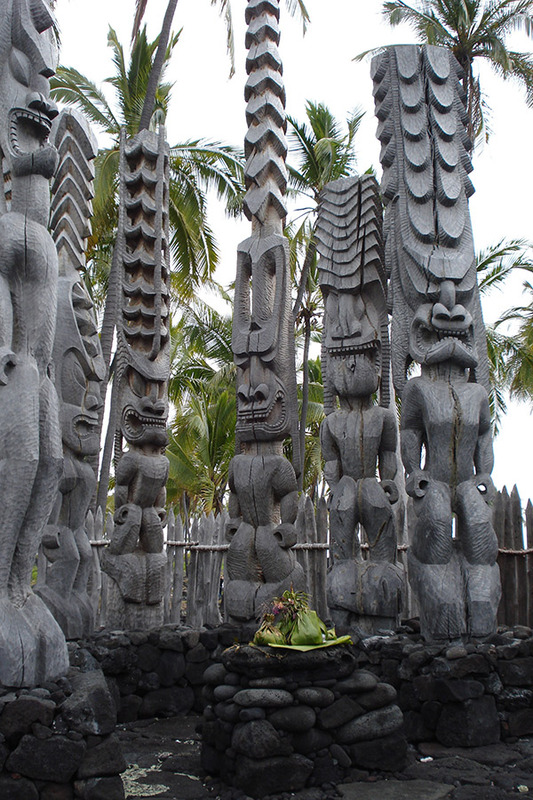 Ancestor worship for the Polynesian peoples included carving the likenesses of gods to create statues called ki’i. If the ancestor or god approved of the carving, he was believed to inhabit the statue. Photo credit: Jeligoods at CanStock. Since ancient times, traditional ki’i were images carved from trees designated as sacred by a Polynesian tribe’s spiritual leader, or Kahuna. It was believed if the god represented in the carving was pleased with the likeness, he would inhabit the statue, which was then put in a special place in a home or on a village building. Just such a Maori sculpture was put on display in 1894 at the California International Midwinter Exposition in San Francisco. After the Exposition, the entire Maori collection was purchased and put on permanent display by de Young Museum of San Francisco. Just four years later, the Hawaiian Islands became a U.S. territory and tourism to the main island of Waikiki grew enough that in 1901, the Moana Hotel opened on Waikiki Beach. Polynesian culture was well on its way to making a lasting impression on the American culture. Travel by ship and later by plane became increasingly possible for many, and vacations in the South Seas became de rigueur for affluent Americans. Hawaiian music already made a strong influence on American culture, when in 1915, roughly 17 million people attended the Panama Exposition in San Fransisco to commemorate the completion of the Panama Canal. Visitors to the exposition heard songs by the Royal Hawaiian Quartette, including “On the Beach at Waikiki”. The following year, Hawaiian music records were outselling nearly all other music at the time, as reported in Edison Records’ monthly newsletter. Following World War I and after the end of Prohibition in 1933, more and more tropically themed bars and lounges opened in the U.S. In 1934 a tropical bar opened that set the standard for all subsequent Polynesian style bars. Now a Tiki Bar legend, it was Ernest Raymond Beaumont-Gantt, world traveller, former bootlegger and friend to many Hollywood elite that sought to bring traditional Polynesian mystique to the U.S. Having recently returned from the South Pacific, he was looking for a new business venture. Based on his love for the tropics and in order to capitalize on the current craze in the U.S. for anything tropical and exotic, he opened a Polynesian style bar and lounge in Los Angeles and named it Donn’s Beachcomber Café. The establishment proved a success and he changed his name to Donn Beach. Donn Beach was determined to give his customers a “real” tropical experience, with food, drink, music and decor. He even had a system installed to spray water on the tin roof of the restaurant to simulate tropical rains. Beach’s customers, including Hollywood elite like Joan Crawford, Marlene Dietrich and David Niven began swarming to the Beachcomber for drinks and food. It was trendy yet classy and Beach was both accommodating and discreet when it came to his celebrity clientele. Beach’s eating and drinking establishment was so successful that in 1937 a competitor named Vic Bergeron opened his own Polynesian restaurant and lounge called Trader Vic’s. So began the famous competition between the two restauranteurs, including Vic Bergeron’s claim that he was actually the creator of the Mai Tai. Now back to the Maori sculpture from the Midwinter Exposition of 1894 (or how “Tiki” became the name of the Polynesian Pop movement in the U.S.). 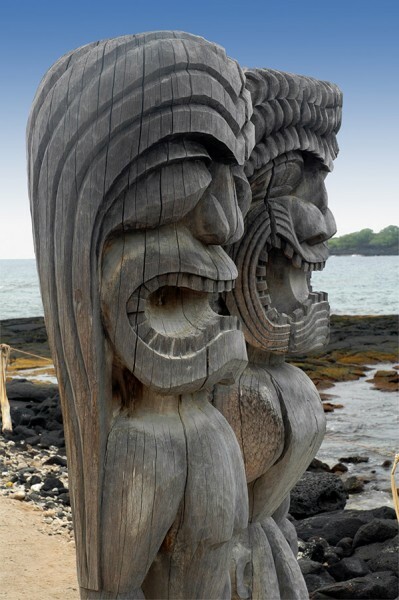 Hawaiian Tiki statues look out to sea on a beach in Hawaii. Photo credit: Waybill at CanStock. When Trader Vic’s opened a new location in Beverly Hills in 1955, they fashioned a wooden likeness of the Maori sculpture from the 1894 California International Midwinter Exposition to stand outside their new bar and lounge. The original Maori sculpture had been a gable post made in the image of a Maori god named “Tiki”. It once stood guard outside a meetinghouse in a Maori village. The newly created version for Trader Vic’s became known as a “tiki statue”. This westernized tiki stood outside a different type of meetinghouse—a Polynesian style restaurant that served rum drinks with little paper umbrellas in them. Trader Vic’s continued to use a similar image of the Tiki god on their menus and other printed pieces throughout the years. This particular image was instrumental in merging “Polynesian” with “Tiki” in the minds of Westerners. Not only did the very successful Trader Vic’s use it, but many other restaurants used similar versions of this image on their printed materials, in addition to recreating it as torch-holding wooden statuary at restaurant entrances. And what began as a single stylish Hollywood bar and lounge, had evolved into many chains of Polynesian restaurants that spread from California and eventually throughout of the United States. It’s important to note that in the 30s, 40s and 50s there was nothing kitschy about Polynesian restaurants. Most U.S. towns by the mid-century had several tiki style lounges. These were upscale establishments that required proper dress attire to enter. Classic Tiki style bars are filled with Polynesian and Hawaiian elements, such as bamboo, Tiki graphics and an array of classic Tiki mugs. Tiki Pop culture flourished when Hawaii was annexed to the United States as the the 50th state on August 21, 1959. Hawaii and Polynesia were already firmly embedded in Americans’ minds as locations for leisure and symbolized a break from a society that was built on conformity and discipline. Rather than just being confined to bars, restaurants and bowling alleys, the Tiki culture in America manifested as a style of decor in fashionable homes, including the preference for “Primitive art” in elegant interiors, including residences and office buildings. The Tiki Pop influence became apparent in its use in the decor of bowling alleys, apartment buildings and motels. A design movement known as Tiki Modern was very fashionable in the 1960s. As a combination of Polynesian themes executed with clean, modern lines, it blended well with the atomic age design aesthetic that was so popular at the time. The Tiki craze came to its climax in the mid-1960s and by the time of the Vietnam War, came crashing to an end. What was once considered stylish and trendy was now considered tacky and passé by a younger crowd that rejected the values and tastes of their parents’ generation. Tiki bars began to close in droves and the popularity of things Tiki waned into the late-1970s. Many may perceive the Tiki style as mid-century kitsch. Strangely, the children of the generation that spurned mid-century Tiki style are embracing this exciting style as a cultural tribute once again. New bars are being built, not only across the U.S., but in Europe as well. There is a very popular tiki restaurant and cocktail bar called Kanaloa in London, and in Berlin Germany there is the Palm Beach—with 5 locations in the city. In September of 2014, there was an exhibit at the Musée du quay Branly in Paris, France called “Tiki Pop” in celebration of a new book by Tiki expert Sven Kirsten which features museum collections as a retrospection of the Maori culture and a look at the modern Tiki craze that its discovery led to throughout the western world. There is even an authentic looking Tiki bar setting as part of the exhibit. There are still structures (both commercial businesses, apartments and and private residences) from the early 1960s that have survived to today. Many of these are excellent examples of tiki architecture at its best—soaring entryway gables and imitation thatched roofs. Many examples can be seen in southern California, where the warmer climate is fitting for Polynesian style and where the taste for Tiki never waned. Although many believe that Tiki had been all but forgotten for a few decades, it never lost its popularity in San Diego. And in pop culture, television shows like “Magnum P.I.” (1980–1988) and “SpongeBob SquarePants” (1999 to the present), and destinations like Walt Disney’s Enchanted Tiki Room at both the Anaheim and Orlando park locations, have kept the Polynesian adventure theme in the forefront of our minds. It’s probably not a coincidence that the original Tiki movement started by Donn Beach occurred during the Great Depression, and that the more recent Tiki Revival began during the economic downturn of 2008–2009, referred by some as the Great Recession. Reality can sometimes become difficult to face, creating a need for escapism in a fantasy world like the one a Tiki bar provides. It’s nice to relax and enjoy friends and food with good drinks, music and tropical ambience, even if only for a little while. 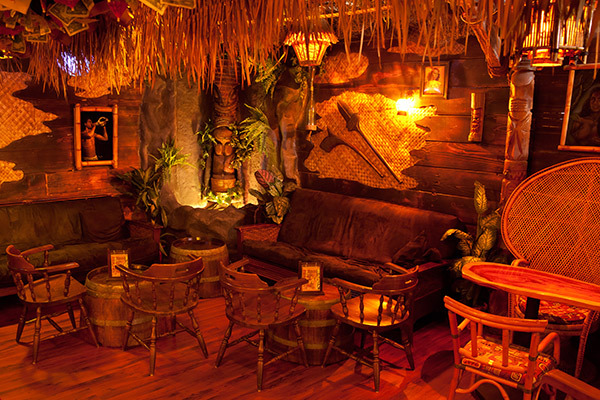 Forbidden Island Tiki Lounge was opened by Michael and Mano Thanos in April of 2006 in Alameda, CA. The decor is done in classic tiki bar style. In San Francisco, beginning in 2000 and running for nine consecutive years, there was an annual Tiki Bar Crawl that had stops in legendary tiki establishments such as Trader Vic’s, the Tonga Room and Forbidden Island. Also in San Francisco, a group of self-professed “tikiphiles” have been holding annual home tiki bar crawls since 2008, with an average of 50 private homeowners participating each year. New tiki bars are being opened as well—like Frankie’s Tiki Room in Las Vegas, in 2008. It now appears on several of the Best Tiki Bars lists. The Hale Pele in Portland, Oregon opened in 2012 and has been “named one of the best rum-centric bars in America” (Eat Magazine, November 2012). Many original Tiki establishments have maintained a loyal following since they first opened, like the Bali Hai in San Diego, California (opened in 1955), Kowloon in Saugus, Massachusetts (opened in 1950), the Mai-Kai Restaurant in Fort Lauderdale, Florida (opened in 1956) and the oldest surviving tiki bar in America—the Tonga Room that was opened in the Fairmont Hotel in San Francisco, California in 1945. Classics like the original tiki bars are now travel destinations for many adventurous folks. These pilgrimage style trips offer an authentic Tiki experience firsthand and allow travelers to become part of Tiki history. Become the next generation to celebrate the Polynesian lifestyle, which includes exciting new tiki carving artists, architectural designers and musicians. Venture on a Tiki trek for your next vacation, or add a tiki bar retreat in your own home. Host a luau. All it takes are some tropical style drinks, some Hawaiian music and a few pupu platters. And don’t forget the awesome Hawaiian shirts. 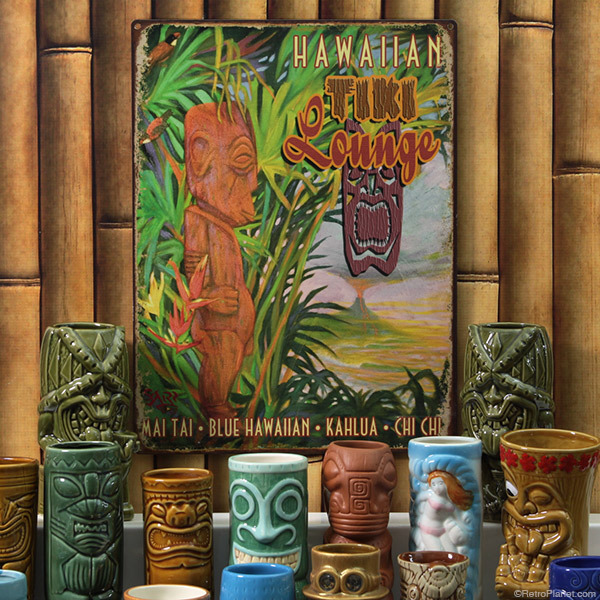 Of course Retro Planet offers a great selection of Tiki items, so be sure the check them out!